For the first time in the UK, Case IH will use LAMMA 2018 to present its new Maxxum ActiveDrive tractor which has just been awarded Machine of the Year, as well as the new Farmall A model. They will be joined by the updated Farmall C tractors and Farmlift telescopic loaders. Case IH Maxxum Multicontroller tractors can now be specified with ActiveDrive 8, a new 24 x 24 semi-powershift transmission which provides eight powershift steps in each of three ranges. Incorporating features which make the tractor more efficient and more relaxing to drive, ActiveDrive 8 joins the existing four-speed 16 x 16 40 km/h semi-powershift and continuously-variable 50 km/h CVX transmission options which have been renamed ActiveDrive 4 and CVXDrive. Range One of ActiveDrive 8, which covers speeds up to 10.2 km/h and is designed for heavier draft work and applications requiring very low speeds, is also available with additional creep speeds. Range Two, covers nearly 90% of field, grassland and loader requirements from 1.6-18.1 km/h. For road travel, the transmission is designed to start in Range Three, and a skip-shift function allows quick progress through the powershift speeds. An auto shift feature allows the tractor to progress automatically through any set of eight speeds in the field, and through all 16 gears in the top two ranges on the road. Because the clutch pedal is not required to change gear, this transmission is suited to power-hungry tasks where maintaining momentum is critical, such as cultivations or operating large mowers. A true power shuttle, it ensures no loss of drive or traction during changes of direction on slopes and incorporates a ‘brake to clutch’ feature. Maxxum Multicontroller models make both tractor and operator more productive, courtesy of the unique Case IH Multicontroller armrest and joystick, which put multiple operating functions at the driver’s fingertips. From full transmission operation via thumb-operated powershift and powershuttle control, to engine speed control and the operation of electronic remote valves, everything is immediately to hand. These tractors can also be specified with mechanical or electronic remote valves. The Maxxum range now includes a new range-topping 175hp (max) six-cylinder Maxxum 150 CVX. Both six-cylinder Maxxum 150 Multicontroller and Maxxum 150 CVX will be fully available from the third quarter of 2018. With this model Case IH now offers the lightest, smallest tractor in the industry with a six-cylinder engine of this power output. Maxxum tractors are powered by FPT Industrial’s 4.5-litre four-cylinder and 6.7-litre six-cylinder turbocharged and intercooled engines, which meet Stage IV emissions regulations using the Hi-eSCR selective catalytic reduction system. Case IH three new multi-task tractors, the 55hp Farmall 55A, 65hp Farmall 65A and 75hp Farmall 75, are light, highly manoeuvrable, easy to use, with low running costs. 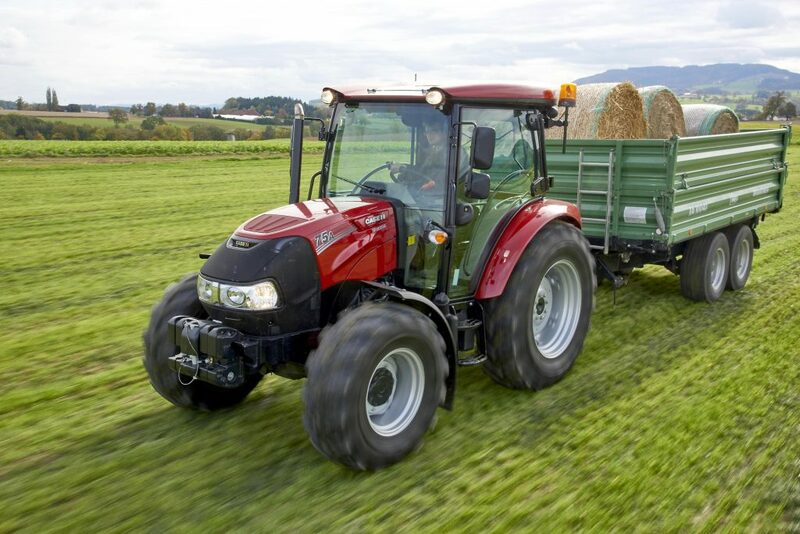 Their design, specification, performance and practicality make them ideal for loader, livestock and municipal applications, as well as for other land-based businesses requiring a low-cost, versatile, easily maintained tractor for general tasks. Attractively-styled, with a sloping bonnet for excellent forward visibility, all are available in two-wheel-drive or four-wheel-drive form, with a spacious, comfortable CAB or ROPS, and options which enable customers to tailor the specification to their exact requirements. Power is supplied by 2.9-litre turbocharged/intercooled engines developed by FPT which achieve maximum power from 1900rpm to 2300rpm, providing a 400rpm Constant Power band, with peak torque produced at 1400rpm. All engines incorporate a maintenance-free Diesel Oxidation Catalyst (DOC) to help meet Stage IIIB emission standards without Diesel Emission Fluid (AdBlue), while the class-leading 600-hour oil change interval minimises servicing costs. A choice of vertical or horizontal exhausts is offered. The standard transmission on two-wheel-drive models is a 30 kph 12 x 12 Mech-Shuttle, while four-wheel-drive models are equipped with a 40 kph 12 x 12 Mech-Shuttle. The optional 40 kph 20 x 20 Creeper transmission provides a minimum forward speed of just 110m/h, while the optional Powershuttle offers clutch-less operation, ideal for tasks which require frequent changes of direction. All models feature a Case IH front axle which is three-point linkage and loader-ready, enabling these to be fitted quickly and easily. The rear axle, which has a maximum capacity of 3700kg, incorporates a mechanically-engaged differential lock and oil-immersed disc brakes. The standard hydraulic trailer braking system provides excellent performance, but a pneumatic system can be specified. The rear three-point linkage sets a benchmark for this class of tractor, providing a maximum lift capacity of 3000kg when an assister ram is fitted. Farmall A models also feature a fully-independent 540rpm, six-spline PTO, with the option of 540/540E and 540/540E plus ground speed units. Providing outstanding all-round visibility through a class-leading 5m2 glass area, the four-post, flat-floor cab offers a quiet, comfortable, relaxing working environment. Meeting FOPS and Level 2 dust protection standards, it incorporates a high-visibility roof panel, single-piece rear window that opens to almost 90°, front and rear worklights, wide-view mirrors and a rotary beacon. Air conditioning is optional. The significantly updated Case IH Farmall C range includes seven compact, versatile models from 58hp to 114hp, all of which incorporate capacity, transmission and control updates to boost comfort and capability. Tractors fitted with a front linkage and the top-specification 24/24 hi/lo transmission with electro-hydraulic power-shuttle can now be specified with the Multicontroller joystick/armrest fitted to larger Case IH tractors, giving fingertip control of key functions. Other improvements include the option of Heavy Duty (HD) axles on models of 86hp and over, a constant speed engine function and true 40kph top speed at just 2,000 engine rpm (300rpm lower than before) to reduce fuel consumption, engine wear and in-cab sound levels without requiring AdBlue. New Farmall C models also feature 540/540E/1000 rpm PTO options and can be ordered loader-ready, incorporating a subframe, hydraulic connections and joystick, making it easy to install a Case IH LRZ premium or LRA economy loader. Case IH Farmlift telescopic loaders have been improved to boost productivity and efficiency while meeting Stage IV emissions regulations. The upgrades, which range from updated engines and LED lighting to an enhanced power shuttle (Farmlift 635 and 742) and the option of higher hydraulic pump capacity (632, 735 and 935). Only the smallest Farmlift 525 remains unchanged. All are powered by NEF four-cylinder engines from FPT Industrial which feature a more efficient turbocharger. A diesel oxidation catalyst (DOC) is the key to meeting Stage IV emissions regulations, working with a selective catalytic reduction (SCR) system which uses diesel exhaust fluid (DEF/AdBlue). The engine in Farmlift 632, 735 and 935 models is rated at 121hp, an increase of 11hp, while the Farmlift 635 and 742 have power outputs of 133hp. Maximum peak power on 632, 735 and 935 models is 133hp, while on the Farmlift 635 and 742 the corresponding figure is 145hp.